Volkswagen has shown a facelifted Up at the Geneva Motor Show, which looks barely any different inside or out but gets trim revisions, some stickers and a new turbo petrol engine. It’s available this summer and will be priced a little higher than the current £8495 starting point. The engine, then. It’s a turbocharged 1.0-litre TSI with 90PS, making it 15PS more powerful than today’s peak Up and getting the car to 62mph in ten seconds flat. It returns a claimed 64.2mpg and puts out just over 100g/km CO2. 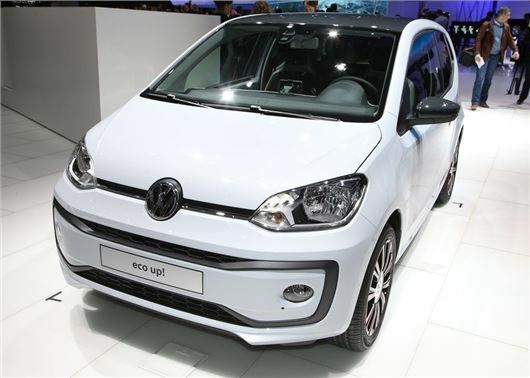 Pay close attention and you may notice a slightly revised front end incorporating sharper headlights with DRLs, while at the back the distinctive dark glass tailgate remains – the main thing separating the Volkswagen city car from the near identical Mii and Citigo. In the cabin the basic architecture remain, but the infotainment system is improved, the steering wheel is multi-function now, and there’s an optional Beats stereo. And to further enhance its appeal to young people, Volkswagen has introduced a handful of sticker designs, contrasting roof colours and some brighter paintjobs.